This may be the most eventful day of the war. There are many and strong reasons to believe that General GRANT has determined to celebrate it by a combined attack on both Richmond and Petersburg. He knows that he cannot keep his army in the position it has held since he crossed the river. His camps are pitched on the most unhealthy ground in Virginia. Hundreds of acres of what is called SORA MARSH, covered every day by water, and the ooze left by the tide dried by the sun, are close around him. Our army holds the high and healthy ground and the good wells. In this position we can afford to be idle and GRANT cannot. Nor is he the man to be idle without excellent cause. He has been quiet for sometime, because time was needed, after all those repulses, to screw his army up to the fighting point again. He has probably prolonged the period of rest in order to make the final trial on this, the national holiday. It has once proven a lucky day to him; but apart from personal considerations, its associations and their effect on the minds of his men, are legitimate elements in a military calculation. Regarding only these general reasons, it would seem high probable, both, that GRANT would fight shortly, and fight on this particular day in preference to all others. The apparent intelligence, both from the northern and the southern banks of the James, is, in the highest degree, confirmatory of the supposition. Indications not to be mistaken point to an assault or a gigantic bombardment of Petersburg this morning—perhaps both will be tried before the sun sets. WARREN’S corps, said to be the largest and best of GRANT’S army, is reported in motion towards the northern bank of the James, and may attack the lines of this city with violence while General LEE is engaged in withstanding or expecting the assault at Petersburg. Sunday, July 3–….My gun, No. 3, was planted on Tim Reeves’ farm on the Jerusalem plank road, about two miles from town. At this point the line of battle is formed fifty yards in advance of battery No. 27 of the city defenses. This line consists of a chain of redans, connected by parapets for infantry support, and at the foot of these formidable works are abatis and other impediments to the rapid rush of the foe. These works had been constructed some time since, and a portion of the first line of defense near the Appomattox (Lee’s extreme left), had been captured by the enemy before the main body of our army had been rushed to the defense of the city. At this time our extreme right is on Hatcher’s Run, and the fortifications cover our lines of communication to the southward. Hence the investment of Petersburg by Grant’s immense army is not complete. Beast Butler is “bottled up” at Deep Bottom by the small force under Beauregard; while Richmond, twenty-two miles distant, is defended by its own chain of forts and earthworks. As to-morrow is the “glorious Fourth,” and we anticipate some sort of celebration by the Yankees, the boys worked hard until midnight on the gun platform and traverse earthworks, so as to get our house in order, and at least die decently. July 4, 1864–Contrary to universal expectation, the once glorious Fourth was ushered into existence without the discharge of a cannon. At sunrise the Yankee bands favored us with a perfect hurricane of national airs, while the star-spangled banner floated from a thousand flagstaffs. Seven standards were visible directly in front of our fort, at a distance of six hundred yards. As a truce has been established between Wright’s (Georgia) skirmishers and the opposing pickets, detailed from Burnside’s Corps, the earthworks on both sides were black with spectators, who shouted at and jeered their opponents in ludicrous style. The “hip, hip, hurrah!” of the Yankees sounded right hearty, founded, as the cry is, on plenty of good grub and whisky galore; on our side the half-famished soldier would tighten his belt, so as to keep down the pangs of hunger, and give a sharp yell of defiance that sounded uncanny in that balmy Virginia air. 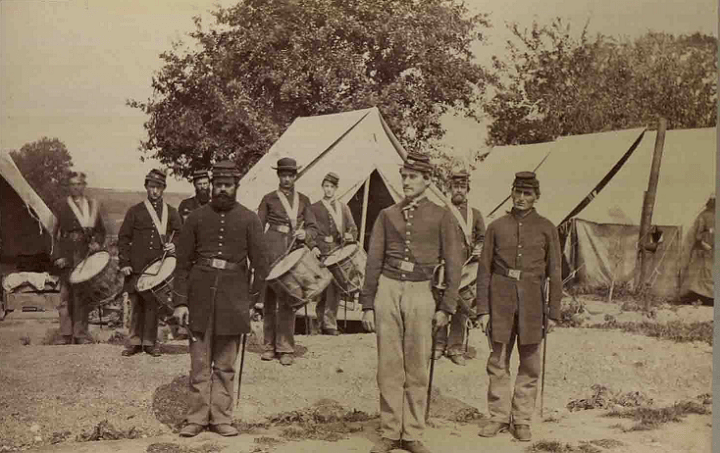 By the aid of field glasses we could distinguish groups of elegantly dressed officers among the “blue jays,” looking our way with undisguised wonder at the temerity of the shabby rebels at flaunting the “stars and bars” betwixt the wind and their nobility. After sundown our bands and those of the enemy indulged in a musical duet. The Yanks played “Dixie” to deride us, but which we cheered; then followed “Yankee Doodle,” which elicited groans and catcalls from our side. At 8 o’clock a pretty exhibition of fireworks was displayed opposite our fort. At the campfire the sentiments of the boys on viewing the old flag were discussed, and the opinion holds that it is now but the symbol of oppression and tyranny. Grant failed to come to time yesterday. The Yankee nation and the Confederate people expected that he had reserved for his nation’s anniversary his final attempt on the Confederate capital. General Lee and his host were ready for the onslaught, but Grant, in the laconic language of the prize ring, failed to come to times. Unusual quiet prevailed along his lines yesterday and remained unbroken till noon. It has been suggested that he was drunk in honour of the day, but we think the difficulty with him was more serious than that. He has discovered that his last and greatest flank movement is no great military movement after all. He has swapped the swamps of the Chickahominy for the marshes of the Appomattox, the hasty earthworks of Cold Harbour for the fortifications of Petersburg, and at length he feels that he has gained nothing by the exchange. Could he have seen the remotest prospect of success, he would have attacked us yesterday. That he did not will cause a blank disappointment to his countrymen at home; indeed, it caused some here. A number of our people went out into Chesterfield yesterday to witness the fight, and came back at night sorely disappointed. Grant did not attack because he is too weak. I’ve known that I wanted to comment on this phenomenon for several years after reading multiple independent sources verify that the Confederates truly expected a massive assault on the entire Richmond-Petersburg line on July 4, 1864. What I can’t figure out is why. At this time, not only was Grant not preparing to attack Richmond and Petersburg, he was more worried about the cavalry divisions of Wilson and Kautz, recently mauled by the Confederates in their recent late June raid. In addition, Grant was about to start sending the Sixth Corps to Washington, D. C. to counteract Early’s raid into Maryland. If you’re reading this and interested in the topic, please let me know if you come across any references to this non-event during the Siege of Petersburg.